Although the Gospel of John is frequently interpreted to be without sacramental meaning or reference, the manner in which the story of Jesus is told reveals a pervasive Christological, sacramental, and ecclesial perspective. The narrative about Jesus is a narrative about the life of the church grounded in and instantiated in baptism and the eucharist. Thus, the story of Jesus is descriptive of the “Way”, that is, of the manner of life begun and sustained through the sacraments of the church; it is descriptive of the “Truth,” that is, of the reality of grace and faith established in the sacraments of the church; it is descriptive of the “Life,” that is, of the life of God which in Jesus has become the life of man. Dr. Weinrich is professor of Early Church History and Patristic Studies at Concordia Theological Seminary (CTSFW), Fort Wayne, Indiana. He is a graduate of the University of Oklahoma, Concordia Seminary, St. Louis (1972), and received his Doctor of Theology degree from the University of Basel, Switzerland (1977). 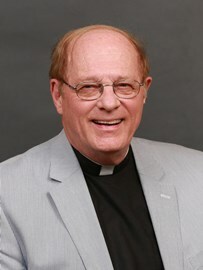 He joined the Seminary faculty in 1975, teaching History and New Testament and was academic dean 1996-2006. He served as rector of the Luther Academy in Riga, Latvia (2007-2010), where he taught extensively and oversaw the Pastoral Ministry Program. He returned to the classroom at CTSFW in 2011 and recently published John 1:1–7:1 for the Concordia Commentaries from Concordia Publishing House. Dr. Weinrich served on the Commission on Theology and Church Relations (1992-2001); Doctrinal Review Commission (1992-1998); Third Vice President, LCMS (1998-2001); Fifth Vice President, LCMS (2001-2004). Mail a check payable to Concordia University Wisconsin and write “Concordia Bible Institute” on the memo line.